After realizing I had never seen this movie, I just had to go out and buy it so I could finally see it. Now I wish I didn’t and I just saved that $2.88 I payed for the DVD. This movie was a major letdown. Not only based on the fact that I found the film extremely slow paced to the point of being boring but also after awhile the whole “23” thing got quite old. Also lets not forget the plot holes. 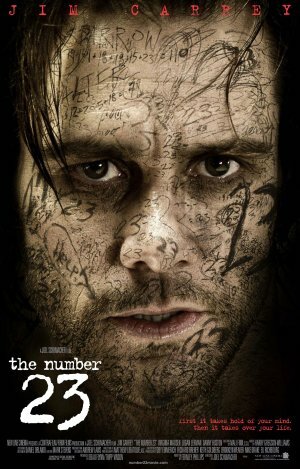 Now Jim Carrey plays crazy well ; just not the actual scary crazy. He’s only good at funny crazy. Now the whole movie is played out going from his real life into the life of the book he reads. Now that can not only get annoying but it almost is confusing as for a majority of the movie you really don’t know what is going on or what to expect. Now like I said previously this movie is slow. You slowly discover what happens but it is in such a fashion that eventually you stop caring since most of the film is just Jim Carrey babbling on and scribbling stuff about how all these random things equal 23 (key note : most of the math is wrong!). The twist at the end is decent enough but really by that time I was so fed up with the movie ; it could have all been a trick by aliens or just a dream and I still wouldn’t of cared. Overall I’d say avoid this.